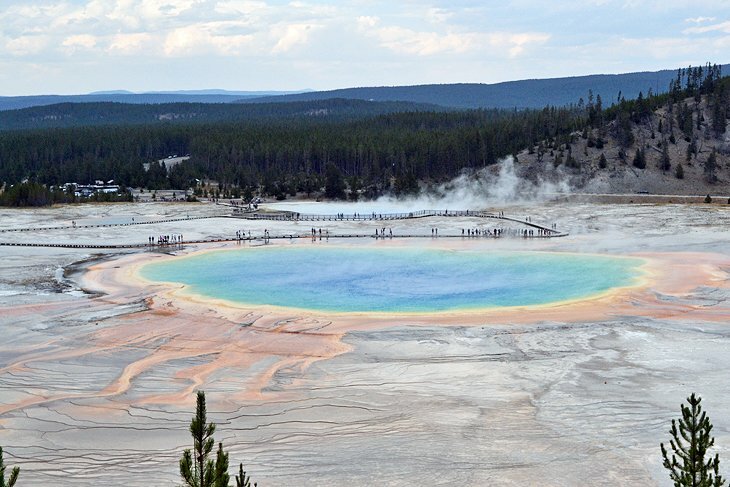 Located within a five-minute drive from the Old Faithful Inn and Upper Geyser Basin, the Midway Geyser Basin is home to one of Yellowstone’s largest and most impressive hydrothermal attractions. Living up to its name, the Grand Prismatic Spring of the Midway Geyser Basin measures approximately 360 feet in diameter, and with clouds of steam churning above the vibrant hues of heat-loving bacteria, it looks like it belongs on another planet. Visitors to the Midway Geyser Basin are encouraged to tour the half-mile boardwalk that skirts the rim of the Grand Prismatic Spring and other mega-sized features of the area. Burbling next to the Grand Prismatic Spring, the Excelsior Geyser Crater is another supersized sight to see, including the thousands of gallons of hydrothermally heated water it pours into the nearby Firehole River.